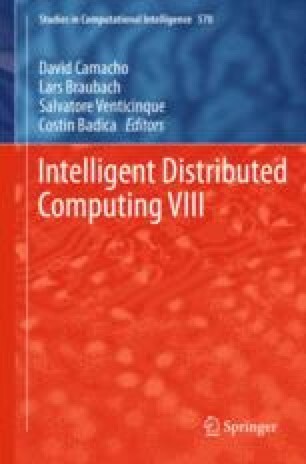 In this work we present a Distributed Regression approach, which works in problems where distributed data sources may have different contexts. Different context is defined as the change of the underlying law of probability in the distributed sources. We present an approach which uses a discrete representation of the probability density functions (pdfs). We create neighborhoods of similar datasets, comparing their pdfs, and use this information to build an ensemble-based approach and to improve a second level model used in this proposal, that is based in stalked generalization. We compare the proposal with other state of the art models with 5 real data sets and obtain favorable results in the majority of the datasets.